Are you one of the many Canadians that just love the inflatable T-Rex costume? They are so comical, you can’t help erupting into laughter! We are not afraid to admit, that watching youtube T-Rex videos is one of our guilty pleasures. So we made a new video. On the first day of Fall, we hit the streets with, a crew, a gaggle, a flock, a Terror of T-Rex’s . (Thank you Google for that information!) Now, we know having a snowball fight is not typically something you would see in fall, however it’s Canada, and wearing a snowsuit under your halloween costume is normalcy. Whatever goes, and that was definitely the case here. Come celebrate Halloween with us, as part of this jurassic event! Saturday, September 29, nation-wide you can take your photo with an inflatable T-Rex from 2 to 4PM. You can also text to win your own Inflatable T-Rex costume! Each location will have a costume for giveaway, so make sure to visit the location nearest you for the text to win details. Or you can text BOO1 to our HauntQuarters to 70707 for a chance to win an Inflatable T-Rex costume just one more time! Do you have an old costume collecting dust? Did you hit our “It Isn’t Over” event last year, and indulge a bit too hard on the 50% off sale? 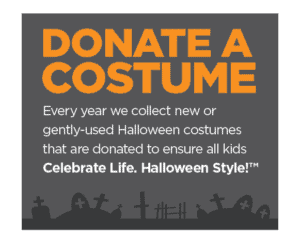 Bring your new or gently used costume in to the location nearest you, and we will donate it, to ensure all kids Celebrate Life. Halloween Style! The countdown is shrinking as we approach Halloween. We have more product arriving across the country almost daily, and almost all locations are now up and running for your Halloween pleasure! Make sure to stay locked to our Facebook and Instagram for more fun, spooky Halloween fun!